A closer look at the Apple TV beta software released on Monday shows Apple is looking to bring iTunes music purchasing functionality back to its set-top streamer, allowing iTunes users yet another place to preview and buy songs. iTunes purchasing in the current Apple TV software is limited to movie and television shows, but the latest beta suggests music buying will be an added feature when Apple releases the next version later this year. As seen above, the Music app now directs to an interface much like the iTunes Store as seen on OS X, complete with scrollable panes and category menus. Previously, selecting Music would open a user's iTunes library. With the beta, users can preview songs, browse artists, and make single track or album purchases. Much of the functionality from the OS X version of the store is brought over to the big screen, though some tweaks were made to the user interface. For example, buying a song will bring up a verification pop-up before allowing users to proceed. Interestingly, clicking on an album from the main menu automatically selects the featured track or current single for that title, making it easier to navigate when using the supplied remote control. 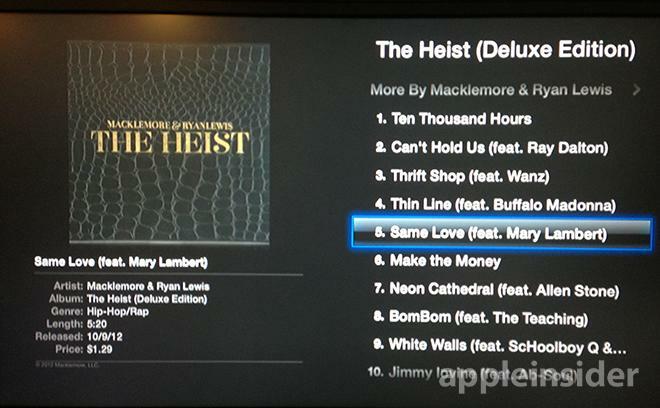 For example, choosing Mackelmore's "The Heist" brings up a track list with the song "Same Love" already highlighted and ready for preview. 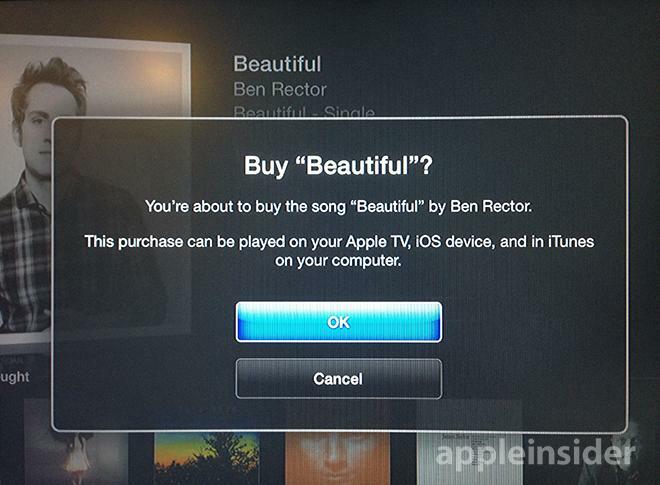 Purchases can be played on the Apple TV, or downloaded onto another device, identical to how iTunes operates on both OS X and iOS. 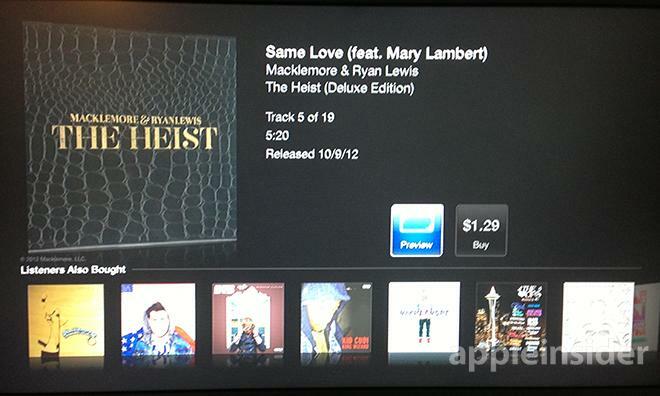 Recent buys are automatically updated as the Apple TV syncs directly to iTunes rather than storing songs on-site. Free "Singles of the Week" are also available, with a "Free" button replacing the graphic containing the usual per-song price. The purchasing process for these tracks is the same as a regularly priced title. Apple is expected to release the next Apple TV software version later this year.